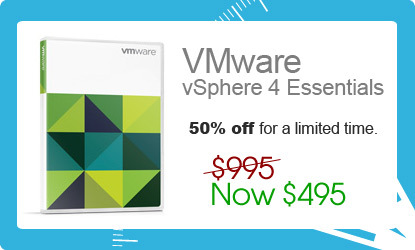 VMWare is currently running a 50% off promotion so you can get vSphere 4 Essentials which usually sells for $995, for just $495! VMware vSphere 4 Essentials provides an all-in-one solution for small offices to consolidate and manage many application workloads while reducing hardware and operating costs with a low up-front investment. Find more updated offers from this VMware discount coupon code promo article.